ATLANTA, October 4, 2017	(Newswire.com) - Agency Spotter releases the Top Marketing Agencies Report for Q3 of 2017. The report features the top 20 marketing agencies across marketing strategy, public relations, experiential marketing, promotions, shopper marketing, influencer marketing, multicultural marketing, word of mouth marketing, events, direct marketing, and marketing automation. Ranking is based on agency credentials, their focus and expertise in different areas of marketing, verified client feedback, and project work. 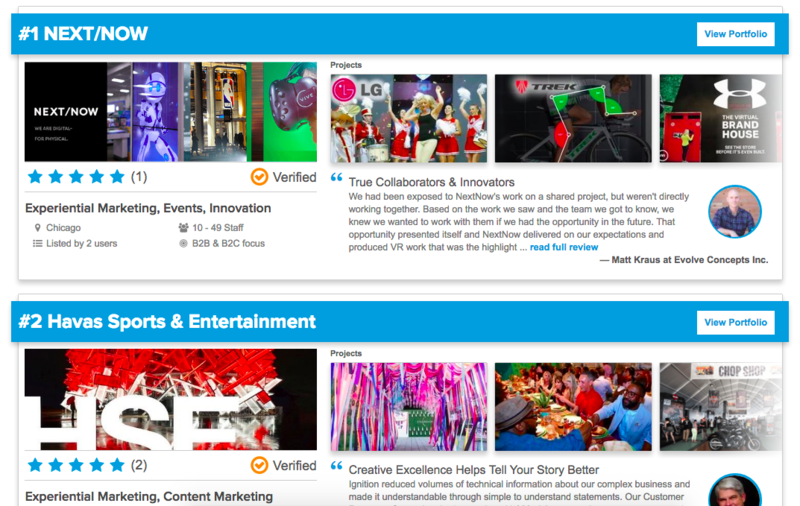 NEXT/NOW, an experiential marketing agency from Chicago, is featured as the #1 marketing agency for Q3. They have worked with great companies like Intel, LG, Accenture, NBA and much more. Client's had nothing but praise for the Chicago agency, saying that NEXT/NOW are, "true collaborators & innovators."